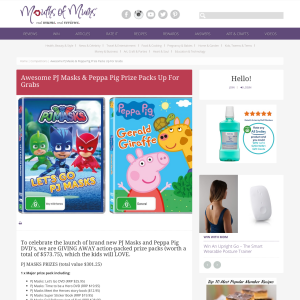 To celebrate the launch of brand new PJ Masks and Peppa Pig DVD’s, we are GIVING AWAY action-packed prize packs (worth a total of $573.75), which the kids will LOVE. ‘LET’S GO PJ MASKS’ is now available on digital and DVD. PJ Masks is the hottest new brand for boys and girls aged 2-7, and with positive and inspiring themes of working as a team, trying your best and making the world a better place, the PJ Masks are taking kids around the globe by storm! By day, 6-year-olds Connor, Amaya and Greg go to school like everyone else. As night falls and they put on their pyjamas and activate their animal amulets, they magically transform into superheroes – Catboy, Owlette and Gekko and become the PJ Masks! Watch out nighttime baddies – the PJ Masks are on their way, into the night to save the day! Join Catboy, Owlette and Gekko in six action-packed episodes as they team up to solve mysteries and learn valuable lessons in PJ Masks: Let’s Go! PEPPA PIG ‘GERALD GIRAFFE’ is now available on digital and DVD. Everyone’s favourite pig is back and she has a new friend to introduce – Gerald Giraffe! Join Peppa Pig in seven fun-filled episodes as she goes to playgroup as usual with her friends only to discover there’s a new addition to the group and his name is Gerald Giraffe. Gerald, however, struggles to join in with their game of hide and seek as, being rather tall, he finds it difficult to hide. Daddy Pig also takes Peppa and George to school on their scooters. He shows Mummy Pig how fun it is then they both ride the scooters to pick up the children. Mummy and Daddy Pig then take Peppa and George to a castle to feast on medieval banquets, play King and Queen and even meet a dragon. It’s George’s favourite day ever! Please note this competition is open from 15 April 2018 until 30 April 2018 and is only available to members of Mouths Of Mums. This competition is a game of skill – answer in 50 words or less. We are unable to accept entries posted via facebook. Facebook LIKE functionality is not a requirement of entry to this competition. The winners of this competition will be published on this page. Winners’ name and address will be provided to the promoter of this competition and prizes will be sent to the address you have in Your Profile. Please ensure your details are up to date so that you receive your prize.